This Sunday is our last Club race of the 2018/19 summer season, and as advised earlier we really do have over half of our grade titles winners yet to be decided. So this Sunday's race will be an important event for everyone, not least of all because we’re holding our season presentation straight after as well. We’ll have our Long, Short and Social courses on offer, and we’ll also provide the juniors with an opportunity to get another practice on our course before the Duathlon season opens up in June. Thank you to everyone who’s performed duties all season. As you’d appreciate, particularly with the recent call-outs for volunteers with the upcoming Ironman event, triathlon is one sport which perhaps relies more heavily on the support of volunteers than any other. Sitting out occasionally to help all our members race is a corner-stone of our Club mechanics, and we really appreciate everyone’s support throughout the season. As advised, we'll be having our 2018/19 season presentation straight after this Sunday’s race, and we'll have plenty of food & drinks for everyone, as well as lucky prize draws. Some great racing yesterday at our penultimate event in the 2018/19 championship series. And we currently have 6 of the 10 Grades titles still pending the results of our last race this coming Sunday 14th April! 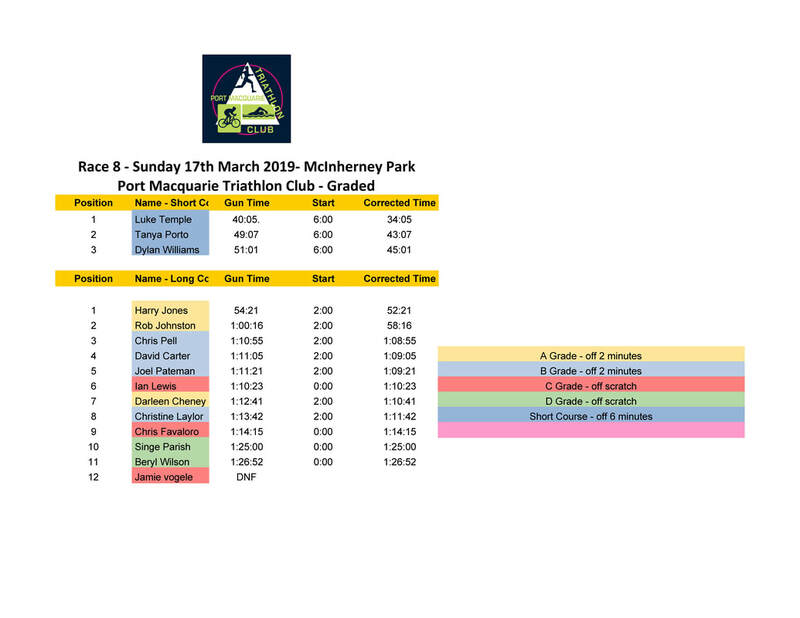 So make sure you're down at McInherney Park this weekend as we're sure to see some tight racing as members wring out those last few precious points from the course. If you haven't already, make sure you go to our Events page for this Sunday & let us know if you're coming along this weekend. After big efforts away up at Coffs Harbour, and then last weekend at the local PMQ Running Festival and down at the 6-Foot Track (congrats Kate & Christine! 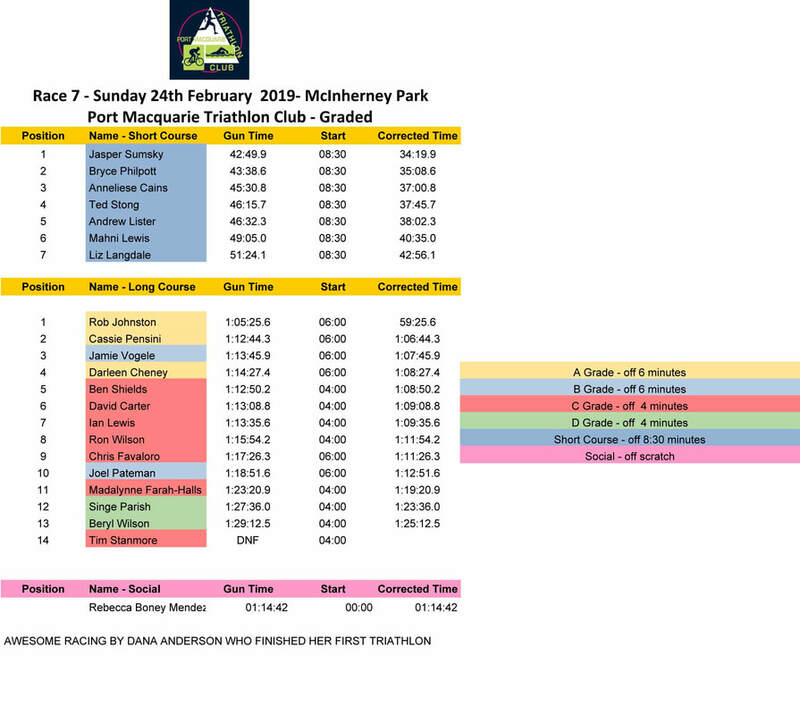 ), we have another local Club race this Sunday from 7.00am. This Sunday, we'll be offering our standard Long, Short and Social courses as well as a junior option. This Race 8 is being generously sponsored by our friends at Enriched Health Care. We appreciate the ongoing and generous support of Simon and his team who’ve been sponsors of the Club for a number of years. If you’re able to help out in the 1 vacant spot at the Ferry, that’d be great! Contact Kate Pensini on 0421606575 if you can fill that role on Sunday. ​If you are already down as one of this Sunday's volunteers, make sure you sign-on at the rego table, and check in with Sarah by 6.00am. The Rego table will be closing at 6.45am sharp and we'll aim to get the race underway as close to 7.00am as possible. Race results from Race 7 are now up! 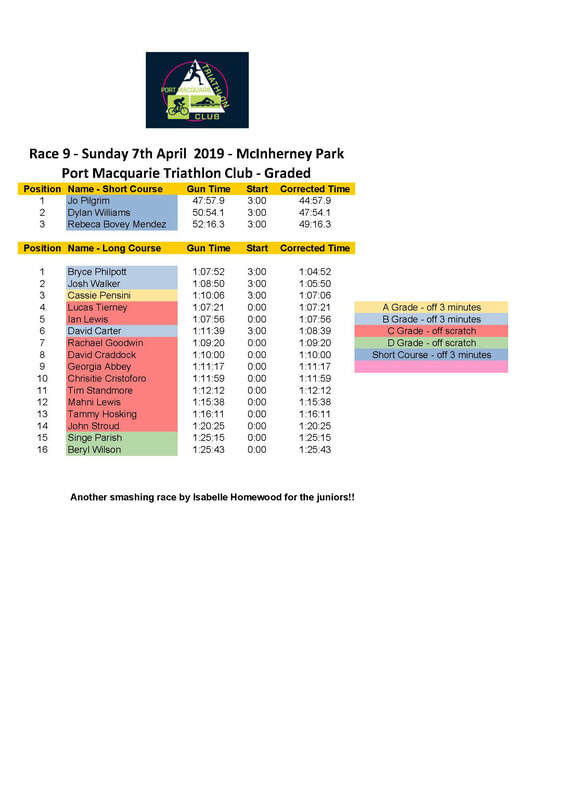 There's been some great results from PMTC members at the latest 2 races on the North Coast Tri Club series. 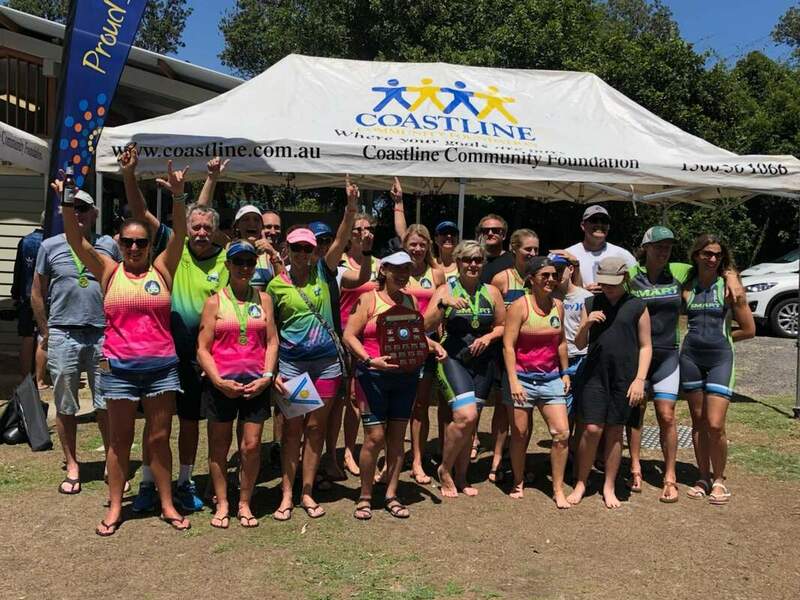 We earned top points at both the Trial Bay Tri, as well as up at Pottsville for the Tweed Coast Enduro, which is a huge effort for a race located so far away! Congratulations to everyone that took part, as well as Karen & Vicky who competed at the Geelong 70.3 last weekend. While we're unlikely to top the North Coast inter-club leaderboard, there's 2 popular races left on the series so we hope everyone has fun at Coffs and Byron. After our recent away races, our local Club racing is back again this Sunday from 7.00am. We'll be offering our standard Long, Short and Social courses as well as a junior option for any of our emerging stars. ​If you are down as one of this Sunday's volunteers, make sure you sign-on at the rego table, and check in with Jodie by 6.00am. The Rego table will be closing at 6.45am sharp and we'll aim to get the race underway as close to 7.00am as possible. Congrats to our members racing away! Some great results filtering in from the Tweed Coast Enduro and down at Geelong from the 70.3. Congrats to all our members who've performed well away from the home track! Race 9 of our summer competition was originally scheduled for the 31st March back when our season began. However, due to subsequent race date announcements for the Laurieton Creek to Creek Adventure Race on that date, as well as Tri Forster on Saturday 30th, we've made the necessary arrangements for the re-scheduling of our club race to the 14th April. As a result, our original Race 10 on 7th April will now become Race 9, and Race 10 will be held on the weekend following, Sunday 14th. So we have four races left in our PMTC Club championships! Those members who'd nominated for duty for those events will be notified by Kate to confirm your attendance. There are still vacancies for all 4 remaining races, so get your names down if you haven't yet performed a race duty. 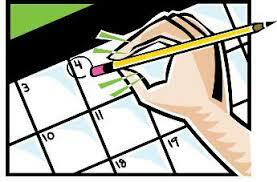 The End of Year Presentation Evening date will also be advised soon.